Orlando Avenue Blog » Blog Archive Summer Snacks with the Kids! Summer Snacks with the Kids! It’s Summer, and it’s hot. The most recent heat wave even had the folks in Vermont breaking a sweat! If the kids are already saying “I’m bored,” or they’re getting cabin fever from having to stay inside in the air conditioning, make the fever go away with some fun, summertime snacks they’ll love helping create! Use small, sturdy paper cups and tongue depressors to make yummy popsicles out of any juice or fruity drink. Place the cups on a tray, fill them with whatever juice you like, cover with strong plastic wrap, poke the tongue depressors through the plastic and into the cup, then put in the freezer for a few hours. Add a scoop of vanilla ice cream before pouring the liquid, and you’ll have a cool, creamy treat! The Seasoned mom has an easy-to-whip-up yogurt-based fruit dip recipe called Poolside Dip. 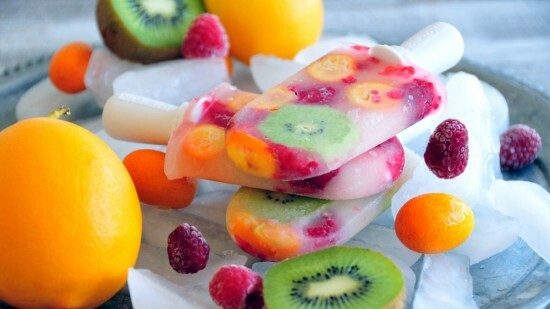 What a great way for the kids to get a good helping of fruit and calcium! Classic chocolate-covered banana pops are easy to make! Cut firm ripe bananas in half, and peel. Push a popsicle stick about halfway in from the cut end, lay on a wax paper-covered cookie sheet, and freeze for at least one hour. While you wait, prep some toppings: chopped pistachios, toffee bits, or colored sprinkles. Pour hardening chocolate sauce like Magic Shell into a cup, and once the bananas are frozen firm, dip them in the sauce, then roll or dip in topping. Return them to the wax paper and freeze for a little longer. Make basil butter for extra tasty corn-on-the-cob: start by mincing a cup of fresh basil leaves, (if the older kids want to do that, supervise them closely! ), and add the chopped leaves to a half cup of softened butter along with a pinch of salt. Mix well and spread onto a warm ear of corn, and they won’t want plain buttered corn on the cob ever again! Melons are fresh and delicious this time of year, so let the kids use cookie cutters to cut sliced melon into fun-shaped snacks! It’s too hot to light the fire pit, so s’mores ice cream pops are what you need! Scoop softened marshmallow ice cream in small paper cups, add a popsicle stick, and freeze for an hour. Place some graham crackers in a plastic zipper bag, and have the kids crush them to pea-sized bits using a rolling pin or a heavy coffee mug. Paper cups can be peeled off the pops, and have the kids pour some chocolate hardening sauce over them, sprinkle with the graham cracker bits, let the chocolate set, and enjoy! Have a milkshake bar! The Spruce has a great guide for making milkshakes of all kinds with a basic recipe and 18 different add-ins for a one-of-a-kind shake. Let’s not forget the fresh veggies that are in season: slice some yellow and zucchini squash, bell peppers, cucumbers, and have the kids carefully put them on a skewer, adding some grape tomatoes. Offer some cheesy dip or hummus, and the kids will devour these veggie kabobs! There are so many benefits to cooking together. Taking the children shopping for fresh fruits and vegetables at the farmers market or harvesting in your garden help them understand where their food comes from. Getting them to help with meals and snacks not only fights boredom, but encourages them to enjoy making the foods they eat, as well as developing an openness to trying new things. And you never know–you may have a chef in the making!